Start-ups are no longer exclusively for mobile app and social network creators. With advancements in personalized medicine and cell biology, the next big thing may come from a burgeoning Life Sciences entrepreneur. Vitruvian Networks, Inc., for example, a newly announced brainchild of GE Ventures and Mayo Clinic Ventures, may help make it possible for mass manufactured cell and gene therapies to reach thousands of patients at their bedsides. But like any other startups, these Life Sciences endeavors need investment to come to life. That’s where Portland comes in. 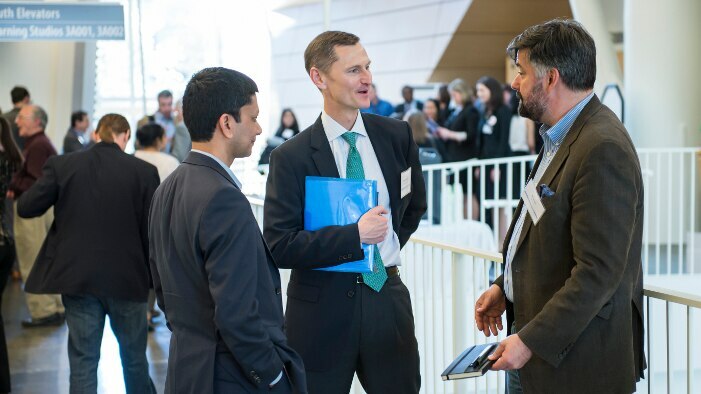 The Department of Technology Transfer and Business Development (TTBD) at Oregon Health & Science University (OHSU) hosts an annual Startup Symposium, the most recent of which occurred this past March, where budding life sciences entrepreneurs get the chance to meet investors and researchers who could bring their visions to life. Dr. Abhijit Banerjee, Director of Business Development at OHSU, addressing attendees at the 2016 symposium. Above: Oregon Health & Science University main campus (image credit: Cacophony, Wikimedia User Commons). “Portland sits in a very interesting place between Seattle and San Francisco,” said Dr. Daniel Dorsa, Senior Vice President for Research at OHSU. “We were typically a fly-over zone in the past, but we are becoming more a fly-in zone for large pharma and medical devices companies. 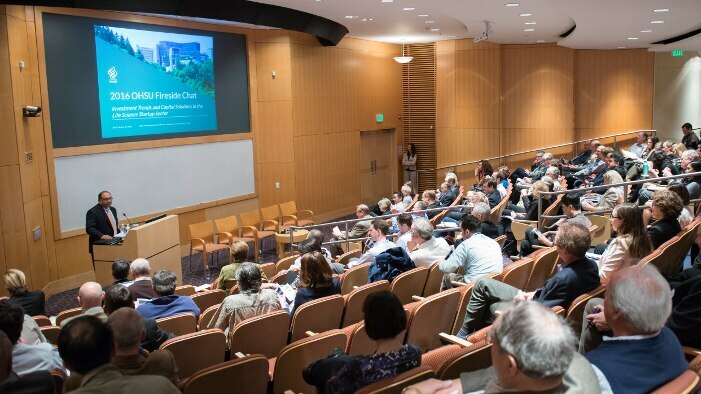 This is a clear indication that we are being noticed, and our startups are being noticed.” A meeting of minds and an intersection of resources, OHSU’s annual symposium has gradually put Portland on the map as a future hub for the life sciences community. In his keynote speech at this year’s event, Flannery shared the company’s plans to invest heavily in the rapidly transforming life sciences field. 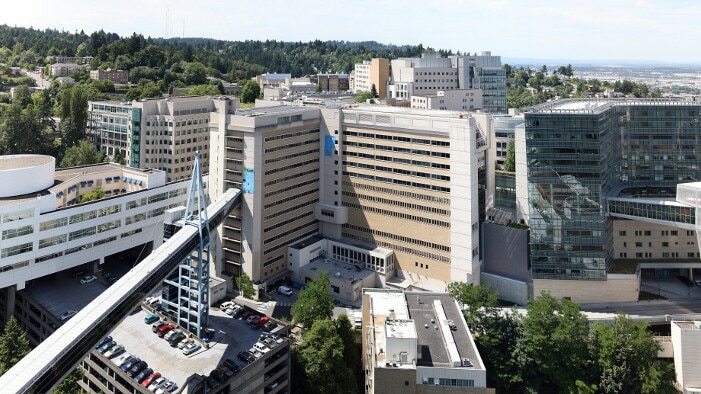 “OHSU is a true leader in this field and we’re proud to be a part of its efforts to invest and convene some of the best minds in the region to support more innovation,” he said. Once the startups are formed, they are an independent entity from OHSU. However, OHSU helps by licencing their intellectual property to those companies, most of the time also initially paying for their patent costs. The ultimate goal is to help new technologies reach patients as soon as possible, so helping them grow in this way is a big part of the process. A meeting of minds: attendees at the 2016 symposium. A partnership between OHSU and GE is set to take support for these startups to the next level in the years to come. GE Healthcare’s Life Sciences business encompasses core imaging, bioprocess, lab and cell therapy businesses. The core imaging segment provides contrast media and radiopharmaceuticals – tracers that are used in conjunction with imaging technology like X-Ray, PET and ultrasound; the bioprocess business spans technology for the manufacturing of biologic drugs from cell culture media and bioreactors to grow cells; the lab business provide tools and technologies for drug discovery, protein science, and bioprocessing research; and cell therapy has a range of innovative solutions to help grow the future of cell therapy with customers by providing novel tools, technologies and methods. GE is no stranger to nurturing promising young companies; their support of dedicated Innovation Villages in the UK and Finland have seen several companies go on to bring ground-breaking therapies to market.